Refractory materials, such as fused quartz plates and rods are welded using a heat source, such as a high power continuous wave carbon dioxide laser. The radiation is optimized through a process of varying the power, the focus, and the feed rates of the laser such that full penetration welds may be accomplished. The process of optimization varies the characteristic wavelengths of the laser until the radiation is almost completely absorbed by the refractory material, thereby leading to a very rapid heating of the material to the melting point. 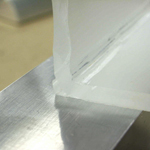 This optimization naturally occurs when a carbon dioxide laser is used to weld quartz. As such this method of quartz welding creates a minimum sized heat-affected zone. Furthermore, the welding apparatus and process requires a ventilation system to carry away the silicon oxides that are produced during the welding process to avoid the deposition of the silicon oxides on the surface of the quartz plates or the contamination of the welds with the silicon oxides. 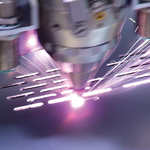 Fiber Laser cutting is among the largest application for lasers in material processing. Fiber Laser cutting offers an advanced alternative to conventional cutting processes. Fiber Laser technology allows for smaller beam diameter therefore decreasing kerf width, decreasing heat propagation (HAZ) and increasing throughput. Fiber Lasers are developed to enhance metal material processing including mild steel, stainless steel, aluminum, brass, copper and other alloys. Fiber Laser applications can range from thin sheet metal to 1 inch thick plate. This range helps fulfill all cutting applications in today’s industrial material processing industry. 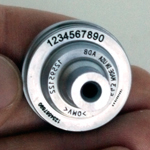 Fiber Laser marking is the most flexible type of direct marking available. The ability to change various laser parameters offers the ultimate in control, quality and speed. Laser Photonics’ Fiber Laser Marking Systems utilize the latest advancements in laser-based material processing. The Fiber Laser marking process is permanent, fast, and flexible, allowing for annealing, etching, engraving and surface marking. Fiber Laser technology offers significant advantages over CO2 lasers and has the ability to mark a wide variety of materials including bare metals, anodized metals, coated metals, coated plastics, ceramics, silicon and thin film etching.